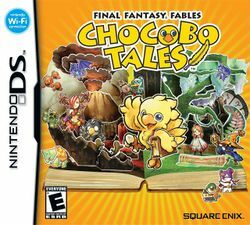 Final Fantasy Fables: Chocobo Tales is an adventure RPG for the Nintendo DS by Square Enix. The game is a collection of mini-games based on popular fairy tales. When successfully completing the mini-games, you unlock cards. The cards are added to a 15-card deck, and used to fight bosses and play online Via Nintendo WiFi. Chocobo Tales features a mix of three different types of gameplay; role-playing, exploration, and card battles. Players explore a 3D environment to find picture books. Upon finding them the player is transported into pop-up picture books to complete minigames and open the path to the next part of the story. The picture books take the form of Aesop's Fables and Grimm's Fairy Tales with the player character often taking the main role. 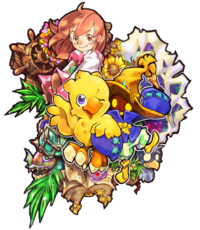 Other Final Fantasy characters take up roles within the stories. More simplistic minigames, known as microgames, are also scattered throughout the world. Unlike minigames, these are not located within pop-up books, do not affect the game-world and are not required to progress in the game. This page was last edited on 6 March 2011, at 23:23.